2017 vintage, this is awesome beer, berliner weisse in name only, trust me, this is more lambic than berliner. maybe it undergoes a sour mash up front, but its definitely wild fermented not finishes with some flavorless ale yeast as is fashionable right now, its also very woody and mature, characteristics not usually associated with the style, this is really fantastic beer, and obviously a base beer they play around with quite a lot. its apparently a blend of some different ages too, which makes sense, there is a tart new thing and a very mature funky thing both happening at the same time. its crazy how complex and good this is, fresh apricot, golden raisin, white wine, cherry, vanilla, lemongrass, very light wheat, and an incredible fermentation profile thats lightly acidic and dry, but then comes back after the swallow with all kinds of musty rustic brett, so evolved, so old worldy, but done in a sort of modern way, i love it! enough carbonation, a very light body, lemons and wine grapes through the finish, new wood, and a bright and attractive tang. phenomenal beer, unique in so many ways, i need to source some more from these guys!!! Pours a pale straw coloration with a foamy head that immediately vanishes completely. Smell is quite funky, with a mild sulphuric quality and certain blue cheese note, with hints of citrus, hay and oak as well. Taste does not quite live up to the nose, being a lot less intense, but still with a lightly funky character backed up by a mild citric acidity and notes of tart green apple and white grape, with hints of citrus, hay, wet grass, oak and a certain mineral/sulphuric note. Finishes quite crisp and dry, with a light citric acidity and some mild funk lingering in the aftertaste. Smooth mouthfeel with a light/medium body and medium/lively carbonation. 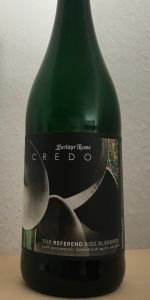 This is certainly not your typical Berliner Weiße, being almost more akin to a Belgian Geuze with its funky/oaky character, but much more light-bodied and less intense, with a stronger carbonation. Does indeed bring to mind a Riesling with its mineral quality, notes of white grape and green apple and strong dryness. The sulphuric note, while not that unpleasant in the first palce, noticeably fades as the beer warms. An interesting beer that is quite refreshing, yet with a certain subtle complexity, but not perfectly balanced, seeming a little neither here nor there. Pours a very light yellow color with a sparkly, bigger head, vanishing soon after pouring. Brings an unforseen level of funk to the nose with a huge blue cheese and moldy oak impact, which leaves enough space for fresh cut lemon and old potatoe skin to cut through. Brings up a floral note, which adds old herbs and banana peel to the aromas, making this quite unusual and exciting on the nose. Has perfectly nuanced carbonation, which is present from the beginning and sparkles up then, highlighting the light and truly refreshing body of the beer. Tastes way lighter than the aromas indicated, with less funk and more, juicy lemon pulp among light straw. Has a carefully nuanced, effervescent middle part with a lighter lemon impact and a nice funkiness, featuring mushrooms, leather and a bit of wet hay, complimenting to the lemon freshness. Finishes truly easy, with just a lighter lemon tartness, almost no funk prevailing and a soothing aqueous softness. This is very different on the nose than it is tastewise. The nose indicates heavy funk and a fuller body, while the beer tastes almost the opposite. Its closer to a light riesling than to a funky gueuze, which, once you can comprehend this trick, start to enjoy quite a bit.